Movie streaming service Netflix has revealed the process it uses to customise the artworks displayed on its site depending on different users' viewing habits. The information, which was revealed on the service's blog, gives readers an in-depth overview of the customisation process, which is done using an algorithm and data stored by Netflix. The algorithm is designed to respond to a user's most watched film genres and actors, to display targeted artwork. The blog post, written by employees Ashok Chandrashekar, Fernando Amat, Justin Basilico and Tony Jebara, gives an example of the film Good Will Hunting starring Matt Damon and the late Robin Williams. It explains that users who mostly watch romantic films will be shown artwork featuring an image of the main character and his love interest. Alternatively, users who predominantly watch comedies are more likely to be shown artwork displaying the character played by Williams – who was a well-known comedy actor. The algorithm also detects trends for specific actors – for example, if a user enjoys watching films featuring Uma Thurman, they will be more likely to see artwork related to the actor. According to the service, the site has seen a "significant lift" in its core metrics as more users have engaged with Netflix's recommendations service. "For many years, the main goal of the Netflix personalized recommendation system has been to get the right titles in front each of our members at the right time," said the team. "If the artwork representing a title captures something compelling to you, then it acts as a gateway into that title and gives you some visual "evidence" for why the title might be good for you," they continued. However, the team pointed out that the algorithm does not always function as a clear-cut rule. Instead, the service aims to use the data provided by the user to navigate what artwork to use. "Of course, not all the scenarios for personalising artwork are this clear and obvious," they said. "We don't enumerate such hand-derived rules but instead rely on the data to tell us what signals to use." "Overall, by personalising artwork we help each title put its best foot forward for every member and thus improve our member experience." The service also displays different artwork to the same user on different pages on the site, to learn their preferences. "For personalisation, the member is the context as we expect different members to respond differently to the images." Netflix was founded in 1997 by Reed Hastings and Marc Randolph. 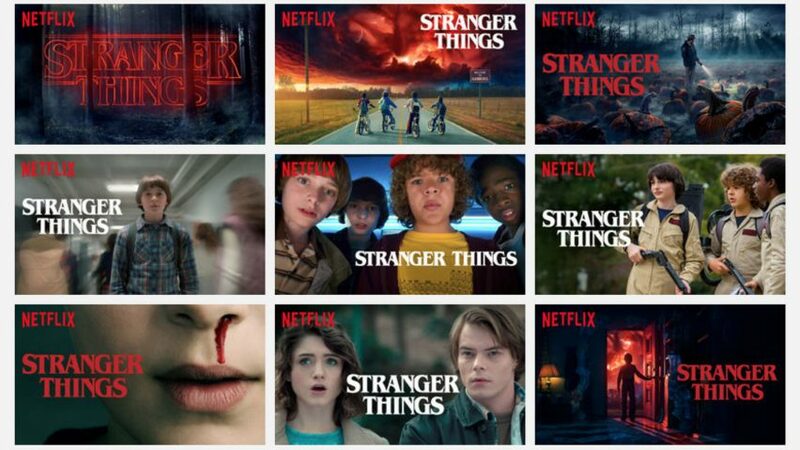 The streaming service, which now has over 100 million subscribers worldwide, often resorts to clever marketing techniques, including Stranger Things posters inspired by retro posters and a cannabis range themed around several of its TV series.